Sunday night I couldn’t stop sneezing – and Monday I woke up and felt like my head was a balloon attached to the leaking faucet that was my nose. Attractive? Absolutely! But while I am recuperating I thought I’d do a little research – what are foods that help you when you’re sick, and how can you eat to avoid feeling like this (i.e. like poop). D adds – and talking like a martian. So what do you eat if you’re already sick?? If you’re like me and can’t taste much – this may be a struggle, but first and foremost – WATER WATER WATER. Lemon and hot water is a particular fave – with a dash of honey if your throat hurts (the perfect trifecta if you ask me!). Honey has antioxidant properties – basically it battle mean little free radicals in your body that damage your cells. Tea is also great – and contains antibacterial properties that help fight viruses. Garlic doesn’t just ward off vampires (see clip for evidence) – it can help battle your cold as well. It’s phytochemicals fight bacteria and have anti-cancer properties to boot! Try throwing some garlic into homemade chicken soup – the ultimate cold comfort food. Finally, mushrooms contain beta-glucans, which can strengthen your body’s immune system to fight the cold. 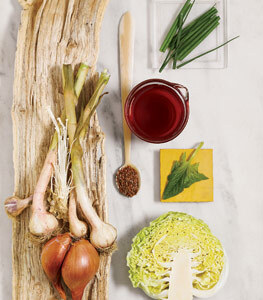 Ok so you’re not sick…but this is the season, so what do you eat to avoid the sniffles? You know I love the stuff – so it makes me quite pleased to say that yogurt can fight off disease – the active cultures in yogurt protect your gut from germs that cause colds! Some studies have found that eating a serving of yogurt a day is better than taking immunity-boosting pills. Grab your sushi – Fish contains selenium, a compound that helps your body produce proteins that flush out flu bacterias from the body. Oats and barley don’t just make a totally satisfying breakfast on a cold morning, they also contain beta-glucans (the same compound found in mushrooms), compounds that have antibacterial properties. Our final immunity boosting food is beef! Beef provides a hearty source of zinc – a vitamin that is crucial to forming white blood cells, cells that fight off bacterial invaders. If you’re not a red meat fan(like me), other great sources are oysters, poultry, milk and yogurt. Needless to say, the ultimate best way to stay healthy is to get plenty of sleep, exercise, and eat a healthy, colorful diet. Now back to blowing my nose…..